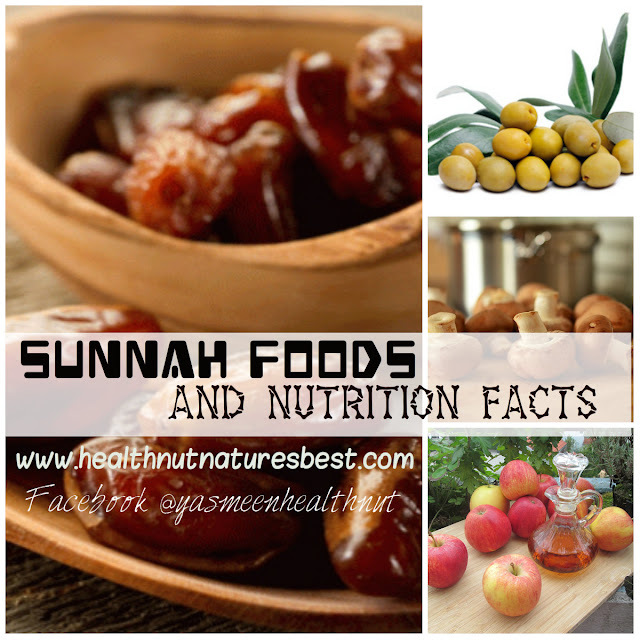 Complete abstinence from food and water during the entire daylight hours in Ramadan helps the body detoxify of illnesses.But one ought to be careful with food choices made during the early dawn(Suhur) and after sunset(Iftar) meals,especially during the long days in summer.Overeating during Suhur is just as bad to the body as overwhelming the empty stomach with empty calories foods(high fat ,excess sugar)during Iftar.The high fat samosas and pakodas have to avoided at the best;dates,fruits and water are enough to break fast[which is also the Sunnah of the Prophet(pbuh)] followed by a wholesome dinner after the Maghrib prayers.I have to admit the deep fried delicacies were once my indulgence, which most certainly gave me the tummy troubles later,but I have been avoiding them in past two years for much more comforting wholesome foods. Simple and nutritious Iftar dinner platter like this(and few more in the meal plan below),with whole grains,vegetables,meats,nuts and fruits, should give the idea of eating right during Ramadan.I'm sending the platter over to Ramadan special events : Umm Mymoonah's Iftar Moments ,Mona's Hyderabadi Ramadan food festival and Lubna's Joy from Fasting to Feasting III. Easy to cook this colorful whole grain pulov covers the carbs and fiber in the meal. 2 tablespoon mint and cilantro, chopped. The spicy chicken bake provides the essential protein.Reduce the spices in case of heart burn troubles. Marinate the chicken in the tandoori masala and salt for an hour or more. 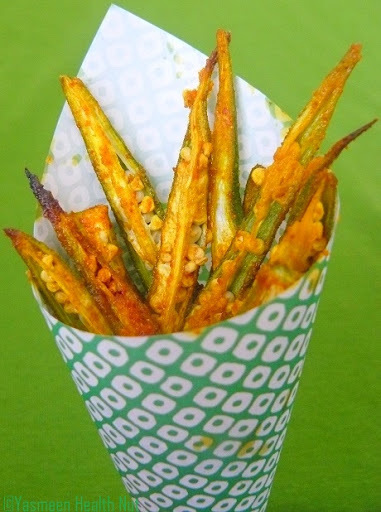 Prepare the sauce,blend all the ingredients under sauce in a food processor or blender. Preheat oven to 325F.Transfer the chicken in an baking dish.Bake for about 35 minutes. Get the dish out of the oven and pour the sauce all over the chicken.Cook for another 25-30 minutes until tender and cooked through.Serve warm with the Veggie Brown Rice Pulov\Pilaf. 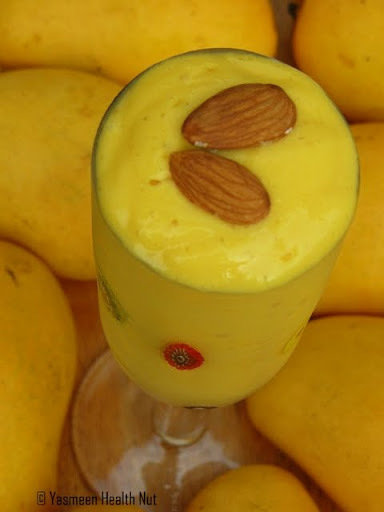 A dessert and thirst quencher in one,the tropical almond lassi is loaded with much needed nutrients from fruits and nuts. The following meal plan was put together keeping in mind the Ramadan Meal plan guidelines,well balanced meals prepared using whole grains,fruits,vegetable.meat,beans and nuts;avoiding excess sugar and fats.Remember to drink lots of water during the non-fasting hours.And keep the snacking between maghrib and taraweeh limited to whole fruits,dried fruits and nuts. 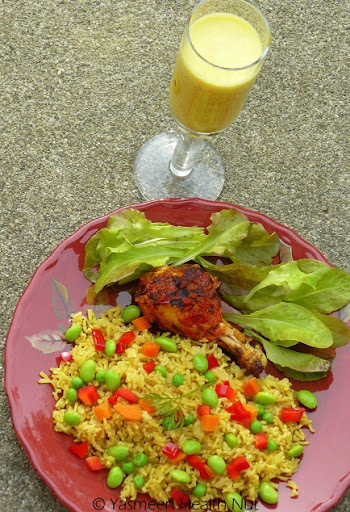 Love the brown rice and smoothie.The menu plan is healthy and filling and very yummy. Love the pilaf and chicken. This is a great meal plan for Ramadan. I got reminded of my dear friend who fasts every year. So colorful and flavorful! A perfect Ramadan dinner. Wow the plate looks very inviting i love the chicken fry its really makes me hungry Yasmeen. 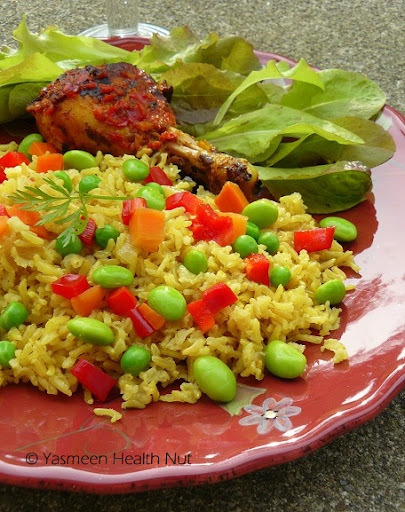 Wonderful and healthy rice pilaf..I have lot of friends out here who will be fasting..Surely will share with them !!! thats a great post Yasmeen. the way you planned the delicious meals makes it balanced and healthy. bookmarking this and will send to friends who will keep fast on this holy month. Wholesome is definitely the way to go and if anyone knows how to do it right, it's you! This looks fantastic. Oh that looks fabulous. I like your idea of the sauce for the tandoori chicken. Good one. Wow, what wholesome meal. If one sticks to foods as such during the whole of Ramadan, then tummy troubles are sure to be at bay. Jazakallahu Khair for sending this as an entry to the event Yasmeen! 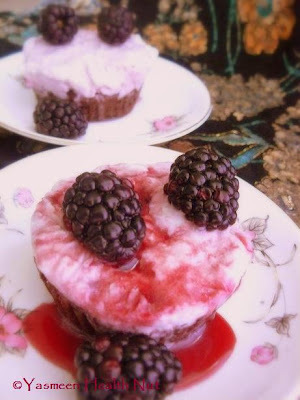 Wonderful meal plan with yummy healthy and nutritious recipes. Wow what a wonderful menu for Ramadhan. All the best with the fasting during Ramadhan. You really take good care of us by suggesting these enticing and balanced meals. Thank you. It is so amazing and great looking for a good meal. Thanks for your posting. I really love this meal. Cheer. Haappyy & delighted to see such a well-planned diet to welcome the Holy month of Ramadhan. And Wish you an eazy-going & a healthy Ramadhaan ! Just came across your blog Yasmeen. This surely rocks. Even though it might be hard to stick to the menu wholly, most of it can be followed. Furthermore, a small suggestion. If you could also mention the nutrient values in each meal, that would be so cool. Also you can write customized menus for people who have heart trouble i.e. food low on cholesterol , or diabetics. Looking forward to seeing your stance on this. Fabulous post !!! I'm going crazy over the chicken fry.Have a wonderful Ramadan. first time here and amazed by this wonderful post.. the dinner looks colourful.. i'm drooling over them.. bookmarked the mango lassie!! I have never seen such a delicious looking rice pilaf! I really enjoy these menus. As much as I love your sample meal plan for Ramadan, Yasmeen ... I gotta admit, it sent my husband into a panic attack! ;) He is anti anything healthy, so you can sure that he wants his Suhur and Iftar loaded with carbs :p Typical man. That certainly looks healthy and would be perfect for anyone health-conscious! 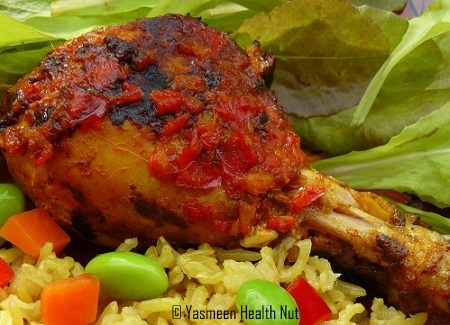 Nice picture of Baked Chicken with Tandoori Masala and red pepper sauce and it includes the wholesome Ramadan dinner and 7 day meal plan. Ramadan Mubarak to all! These Ramadan iftar ideas are really amazing.